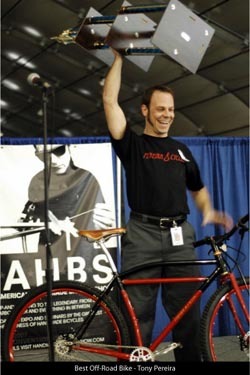 The 4th Annual North American Handmade Bicycle Show (NAHBS), the world's largest consumer show for custom-built bicycles, will be held at the Oregon Convention Center, Portland, February 8-10, 2008, and it is shaping up to build considerably on the success of '07. "We have 60 registered exhibitors so far, which is where we were at in December last year, and international interest is running way ahead of last year too. Having had very good media exposure in Britain, Germany and Italy, there have been a lot more enquiries from those nations, and we've had enquiries from Japan too," explained Don Walker the show's founder and director. NAHBS is a consumer-based show celebrating the finest in bicycle design, materials and manufacturing. Reflecting the frame builders' very personal approaches with each product and each customer, the show facilitates and encourages personal conversations between builders and customers, rather than a being a showy tradeshow with enormous booths and neon graphics. "For us, it is much more about what we are capable of doing, rather than what we may think we will sell the most of," says Joe Ingram of Independent Fabrication, which is making NAHBS its only public show in '08. He added: "We love it at NAHBS, it's not only a great place to talk to customers and take orders, but it's a great opportunity to get inspired by what other frame builders are doing." Next year, for the first time, the show will make Friday a trade-only day. "We're primarily a consumer show, so this shouldn't be seen as a first step toward being a trade show, but we're also a meeting of the tribes in the handmade bicycle industry. Our trade day merely recognizes the importance of the show as an opportunity for frame builders to meet one another, to spend quality time with dealer contacts, and to get into some depth with journalists. It's gotten so busy on the public days there isn't time for any of that," said Don Walker. Once again, NAHBS is offering sponsorship opportunities for companies that target the higher income cycling demographic. Sponsors will enjoy exposure to over 10,000 very targeted consumers; pre- and post-show media coverage; online exposure; complimentary booth space; a negotiable number of complimentary tickets to the show; and an ad in the show program. Please contact Dave Hemming (tel. 503-724-7120) or Paul Skilbeck (tel. 415-346-8422) for more information about sponsorship. Registration enquiries should go to Don Walker (tel. 254-733-9014). The North American Handmade Bicycle Show is dedicated to showcasing the talents of individuals around the world whose art form is the bicycle. It aims to be a gathering point  online and in person  for frame builders and consumers looking for custom-made bikes, for the sharing of ideas and promotion of this special industry which has such a rich history. After three years of growing by leaps and bounds, NAHBS 2008 will feature still more exhibitors, consumers and a wealth of seminars. For more information, see www.handmadebicycleshow.com.